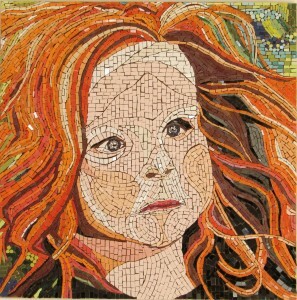 All descriptors of Susan Rudolf’s work as a mosaic artist. The talented and celebrated artist grew up in Pecs, Hungary, a city more than 2,000 years old. She moved for a time to Vienna, Austria, and finally settled in Curaçao nearly 15 years ago. Searching for a more tranquil way of life, Susan felt an immediate connection with the island. Peace settled in her heart as she found beauty in the environment: the calm of the sea, the diversity in the flora and fauna, and the colors in the people and places of Curaçao. Like most people, Susan has had her fair share of heartache and struggle, but after visiting her studio to talk about her work, I challenge that Susan’s struggles in life paved the way for her art, and I am fairly certain the world is just now being introduced to someone who will become an important artist of our time. Gaining recognition on a world stage is not only a goal of Susan’s, it is now very much her reality. 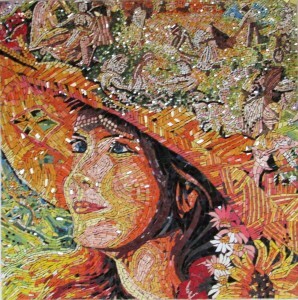 In October 2015, Susan’s mosaic Cora was accepted to the prestigious Mosaiques en Nord. Exhibited at the Centre Socio Educatif d’Hazebrouck and Le Musée des Augustins d’Hazebrouck in North Hazebrouck, France. Cora delighted many visitors until the exhibition end this January. Confident in capturing the intimacies of the human face, Susan, unlike many other mosaicists today, does not shy away from the concrete. Her mosaic, The Girl with the Mysterious Smile, displays beauty and familiarity throughout the face with hidden treasure in the foreground. The bicyclists, farmers and children at play, dance in the The Girl’s imagination as we marvel at the whimsical and colorful presentation. The Girl with the Mysterious Smile has traveled on exhibition as well, but can now be found at Susan’s Gallery on the road to Groot St. Joris in Santa Catharina. Her inspiration comes from the beauty all around her and works of contemporary artist Josephine Wall. While the island has much beauty to offer, her true inspiration is her daughter Nancy. 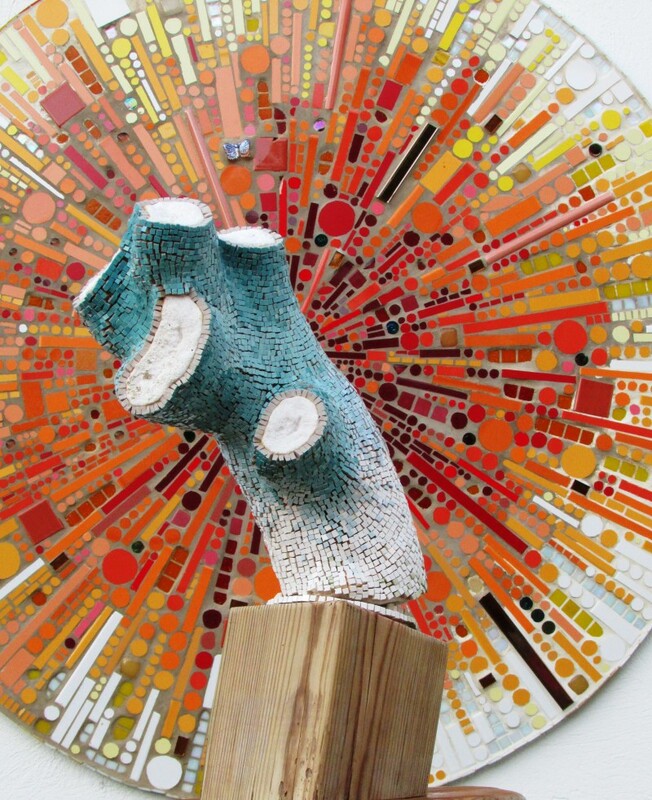 Besides exhibitions abroad in Italy, New York, France and Austria, Susan is a celebrated artist in books as well as in local exhibitions in Curaçao. 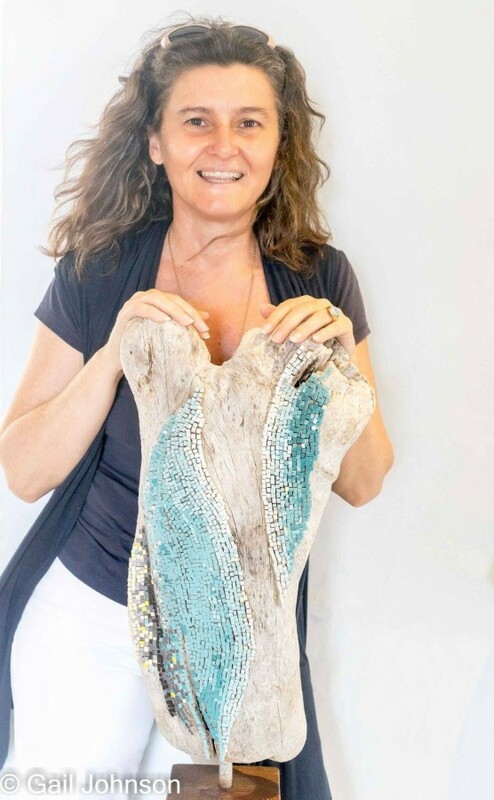 Featured in a solo exhibition at the Landhuis Bloemhof as well as Albert Hein, where you can also marvel at her latest tessellated series on driftwood found on the shores of Curaçao, such as the piece La Mer se Souvient. Susan’s mosaics are admired by tourists and locals alike. Take the opportunity to visit Susan Rudolf and her gallery during your stay in Curaçao. 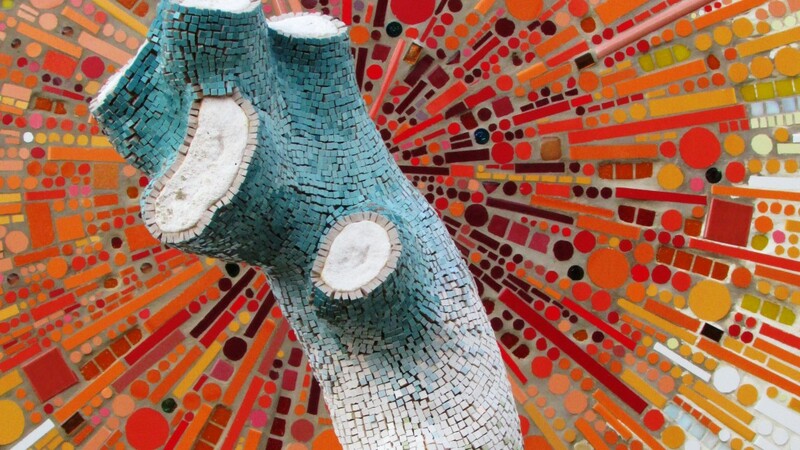 Besides meeting one of the world’s up-and-coming mosaicists, you’ll also gain a sense of perspective on the world in which we live, grow, experience and love.